^ Pakenham 1992, pp. 253–5. ^ 7.0 7.1 7.2 Turner 2007, p. 28. ^ 9.0 9.1 Freund 1998, pp. 198–9. ^ Borstelmann 1993, pp. 92–3. ^ Zeilig 2008, pp. 64–5. ^ 15.0 15.1 Zeilig 2008, p. 76. ^ Zeilig 2008, pp. 65–6. ^ Zeilig 2008, pp. 82–3. ^ Zeilig 2008, pp. 83–5. ^ 21.0 21.1 Zeilig 2008, p. 70. ^ 24.0 24.1 Zeilig 2008, p. 88. ^ 25.0 25.1 Zeilig 2008, p. 87. ^ Zeilig 2008, p. 89-91. ^ Zeilig 2008, pp. 90–1. ^ Zeilig 2008, pp. 93–4. ^ Zeilig 2008, pp. 100–1. ^ 33.0 33.1 33.2 33.3 33.4 33.5 33.6 EISA 2002a. ^ 35.0 35.1 35.2 Zeilig 2008, p. 102. ^ 36.0 36.1 36.2 36.3 Zeilig 2008, p. 103. ^ 37.0 37.1 37.2 Gondola 2002, p. 118. ^ 38.0 38.1 Zeilig 2008, p. 104. ^ 39.0 39.1 Renton，Seddon & Zeilig 2007, p. 113. ^ 40.0 40.1 40.2 Gondola 2002, p. 119. ^ 41.0 41.1 Zeilig 2008, p. 105. ^ 42.0 42.1 Nugent 2004, p. 85. ^ Nugent 2004, pp. 85–6. ^ 45.0 45.1 45.2 45.3 45.4 Nugent 2004, p. 86. ^ Nugent 2004, p. 97. ^ Zeilig 2008, pp. 110–1. ^ 51.0 51.1 51.2 Zeilig 2008, p. 116. ^ 53.0 53.1 53.2 Zeilig 2008, p. 114. ^ Haskin 2005, pp. 33. ^ 57.0 57.1 57.2 57.3 Nzongola-Ntalaja 2007, p. 108. ^ 60.0 60.1 Zeilig 2008, p. 117. ^ 63.0 63.1 63.2 Nugent 2004, p. 87. ^ Zeilig 2008, pp. 120–2. ^ 73.0 73.1 Boulden 2001, p. 35. ^ 75.0 75.1 Whelan 2006, pp. 8, 60–62. ^ 76.0 76.1 76.2 76.3 Boulden 2001, p. 36. ^ 80.0 80.1 Boulden 2001, p. 40. ^ Gleijeses 1994, pp. 73–4. ^ 85.0 85.1 Freund 1998, p. 202. ^ 88.0 88.1 88.2 Verhaegen 1967, p. 346. ^ Fox，de Craemer & Ribeaucourt 1965, p. 78. ^ Verhaegen 1967, pp. 352–4. ^ 98.0 98.1 Gleijeses 1994, p. 81. ^ Mockler 1986, pp. 116–7. ^ Mockler 1986, pp. 118–9. ^ 106.0 106.1 Nzongola-Ntalaja 2007, p. 136. ^ Nzongola-Ntalaja 2007, pp. 138–9. ^ Gleijeses 1994, pp. 84–5. ^ 110.0 110.1 110.2 110.3 EISA 2002b. ^ 111.0 111.1 111.2 111.3 111.4 Nugent 2004, p. 233. ^ Nugent 2004, pp. 234–5. ^ Nugent 2004, pp. 236–9. ^ 114.0 114.1 Zeilig 2008, p. 140. ^ 117.0 117.1 Turner 2007, p. 185. ^ Haskin 2005, pp. 40–1. ^ Nugent 2004, pp. 88–9. ^ Gibbs 1996, p. 453. ^ Meredith 1984, pp. 281–2. ^ Meredith 1984, pp. 282–3. ^ 131.0 131.1 Turner 2007, p. 149. ^ Nugent 2004, pp. 89; 96–7. 1961: Lumumba Rally Clashes with UK Police. On this Day. BBC. 2008-02-19 [2014-07-08]. Belgium link in Lumumba death. BBC. 2001-11-16 [2014-07-11]. Boulden, Jane. Peace Enforcement: The United Nations Experience in Congo, Somalia, and Bosnia 1st. Westport, Conn.: Praeger. 2001. ISBN 0-275-96906-1. Borstelmann, Thomas. Apartheid, Colonialism, and the Cold War: the United States and Southern Africa, 1945–1952. New York: Oxford University Press. 1993. ISBN 0-19-507942-6. Braeckman, Colette. 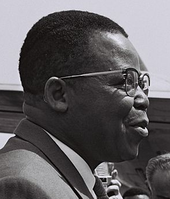 Antoine Gizenga ou la revanche de l'histoire. Le Soir. 2007-01-02 [2014-07-08]. Dorn, A. Walter. Air Power in UN Operations: Wings for Peace. Military Strategy and Operational Art. Routledge. 2016. ISBN 9781317183396. DRC: Background to the 1965 election. Electoral Institute for Sustainable Democracy in Africa (EISA). [2014-07-08]. （原始内容存档于2014-07-25）. DRC: Constitutional Crisis between Kasavubu and Tshombe. Electoral Institute for Sustainable Democracy in Africa (EISA). [2014-07-08]. （原始内容存档于2014-07-25）. Fox, Renee C.; Craemer, Willy, de; Ribeaucourt, Jean-Marie. "The Second Independence": A Case Study of the Kwilu Rebellion in the Congo. Comparative Studies in Society and History. October 1965, 8 (1): 78–109. JSTOR 177537. doi:10.1017/s0010417500003911. Freund, Bill. The Making of Contemporary Africa: The Development of African Society since 1800 2nd. Basingstoke: Palgrave-Macmillan. 1998. ISBN 978-0-333-69872-3. Gendebien, Paul-Henry. L'Intervention Des Nations Unies Au Congo. 1960–1964. Berlin: Walter de Gruyter. 1967. ISBN 978-3-11-113787-2. Gibbs, David N. The Political Economy of Third World Intervention: Mines, Money, and U.S. Policy in the Congo Crisis. American Politics and Political Economy. University of Chicago Press. 1991. ISBN 9780226290713. Gibbs, David N. Misrepresenting the Congo Crisis. African Affairs. July 1996, 95 (380): 453–9. JSTOR 723578. doi:10.1093/oxfordjournals.afraf.a007743. Gleijeses, Piero. "Flee! The White Giants Are Coming! ": The United States, the Mercenaries, and the Congo, 1964–65 (PDF). Diplomatic History. April 1994, 18 (2): 207–37. ISSN 0145-2096. doi:10.1111/j.1467-7709.1994.tb00611.x. Gondola, Didier. The History of Congo. Westport, Connecticut: Greenwood. 2002. ISBN 978-0-313-31696-8. Haskin, Jeanne M. The Tragic State of the Congo: From Decolonization to Dictatorship. New York: Algora Publishing. 2005. ISBN 0-87586-416-3. Horn, Bernd; Harris, Stephen John (编). Warrior Chiefs: Perspectives on Senior Canadian Military Leaders illustrated. Dundurn. 2001. ISBN 9781550023510. Jullien, Maud. Katanga: Fighting for DR Congo's cash cow to secede. BBC Africa. BBC. 2013-08-11 [2014-07-11]. Meredith, Martin. The First Dance of Freedom: Black Africa in the Postwar Era 1st US. London: Hamish Hamilton. 1984. ISBN 978-0-241-11340-0. Mockler, Anthony. Soldiers of Fortune: 5 Commando, the Congo 1964–65 1 (6). Orbis. The Elite. 1986: 116–120. ISSN 0030-4387. Mwakikagile, Godfrey. Statecraft and Nation Building in Africa: A Post-colonial Study. Dar es Salaam: New Africa Press. 2014. ISBN 978-9987-16-039-6. Nugent, Paul. Africa since Independence: A Comparative History. New York: Palgrave-MacMillan. 2004. ISBN 978-0-333-68273-9. Nzongola-Ntalaja, Georges. The Congo, From Leopold to Kabila: A People's History 3rd. New York: Palgrave. 2007. ISBN 978-1-84277-053-5. Packham, Eric S. Freedom and Anarchy illustrated. Nova Publishers. 1996. ISBN 9781560722328. Pakenham, Thomas. The Scramble for Africa: the White Man's Conquest of the Dark Continent from 1876 to 1912 13th. London: Abacus. 1992. ISBN 978-0-349-10449-2. Renton, David; Seddon, David; Zeilig, Leo. The Congo: Plunder and Resistance. London: Zed Books. 2007. ISBN 978-1-84277-485-4. Struelens, Michel. The United Nations in the Congo, Or O.N.U.C., and International Politics 1st. Brussels: Max Arnold. 1978. OCLC 2618699. Turner, Thomas. The Congo Wars: Conflict, Myth, and Reality 2nd. London: Zed Books. 2007. ISBN 978-1-84277-688-9. United Nations Security Council. UN Resolution 169. United Nations Documents. [2014-07-08]. Whelan, Michael. The Battle of Jadotville: Irish Soldiers in Combat in the Congo 1961 (pdf). Dublin: South Dublin Libraries. 2006. ISBN 978-0-9547660-6-1. Wood, J. R. T. So Far and No Further! Rhodesia's Bid For Independence During the Retreat From Empire 1959–1965. Victoria, British Columbia: Trafford Publishing. 2005. ISBN 978-1-4120-4952-8. Zeilig, Leo. Lumumba: Africa's Lost Leader. London: Haus. 2008. ISBN 978-1-905791-02-6. De Witte, Ludo. The Assassination of Lumumba Trans. London: Verso. 2002. ISBN 1-85984-410-3. Gérard-Libois, Jules. Katanga Secession. Trans. Young, Rebecca. Madison: University of Wisconsin Press. 1966. OCLC 477435. Hughes, Matthew. Fighting for White Rule in Africa: The Central African Federation, Katanga, and the Congo Crisis, 1958–1965. The International History Review. September 2003, 25 (3): 592–615. JSTOR 40109400. doi:10.1080/07075332.2003.9641007. Kaplan, Lawrence S. The United States, Belgium, and the Congo Crisis of 1960. The Review of Politics. April 1967, 29 (2): 239–56. JSTOR 1405667. doi:10.1017/s0034670500023949. Namikas, Lise. Battleground Africa: Cold War in the Congo, 1960–1965. Washington, D.C.: Woodrow Wilson Center Press. 2013. ISBN 978-0-8047-8486-3. Weiss, Herbert. The Congo's Independence Struggle Viewed Fifty Years Later. African Studies Review. April 2012, 55 (1): 109–15. JSTOR 41804131. doi:10.1017/s0034670500023949.